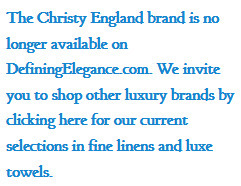 Christy England Hampton Bedding - Swatches may be available. Skillfully designed with a modern approach to classic embroidery, Hampton is adorned with an intricate array of expertly executed floral motifs creating a relaxed yet sophisticated sense of style. Face: 200 Thread Count 100% cotton percale with embroidered detail.